[OFFICIAL] Oryx Entertainment PHANTOMCHEF MIXTAPE powered by Super Sensational Turntable Wizard with over 2 Decade of DJ Experience with Airplay time of over 65000 Hours on Radio all over Nigeria, The Dopiest Dj with the highest reach on Radio. 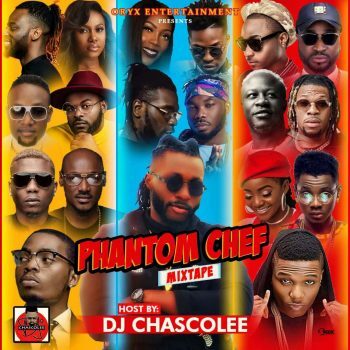 Phantom chef Mixtape all-stars CD compilation (a project that has been in the back burner for years) featuring music from a diverse group of young Nigerian acts from all over the globe on this compilation, of by definition meaning a fusion of music that is relatively obscure and is a reaction against popularized aesthetic music) but still funky, danceable and very melodic. Also featured are tracks by award winning veterans Hip-hop lyricists, entrepreneur and rhyme master Olamide, Phyno, Dbanj and ELDON On a delectable fusion of R’n’B and Afropop genre. The tracks catchy hooks and unique composition already has the hit rated as the ‘song of the summer’- and is sure to be doing serious rounds on DJ’s turn tables across the globe!